I've been working on a game for a couple of weeks now. I've come to a point where I feel somewhat comfortable with sharing my game with the masses (the Löve userbase is massive enough for now, haha). I am really interested in a review from some of you people. So if you've got the time to playtest this, and share your feedback, that would be delightful! Please do keep in mind that this game is a work in progress, and barely in alpha stage. Yet I do believe that it's easy to get an idea of what the full product will be right now. 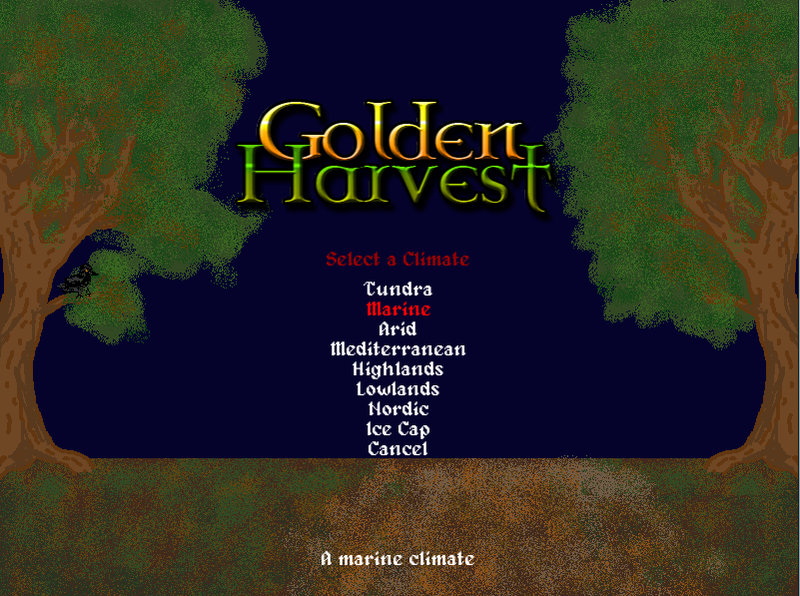 Golden Harvest is a roguelite game about survival. 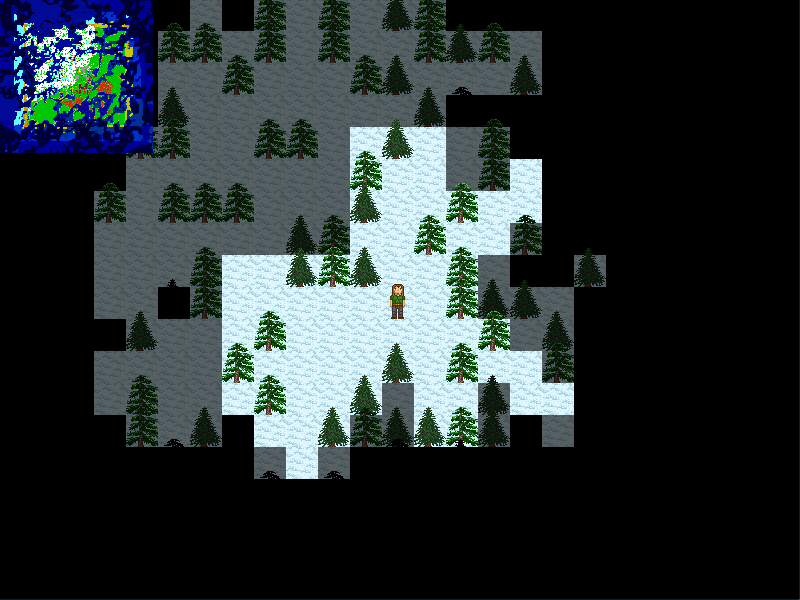 You find yourself on a desolate island (the island is randomly generated). And you've got various skills at your disposal which you can use to survive. For starters, you want to grab a few rocks and carve a primitive axe and pickaxe out of it. Now you have the ability to chop wood, and mine stone. The (pick)axes can be used as a weapon as well, although you want to make better weapons (battleaxes, swords, warhammers, bows) as soon as possible. Now you've got the ability to build various tools to help with your survival, like a campfire or iron pot for cooking, an anvil for smithing, a kiln for smelting, etcetera. Collect different items to unlock new crafting recipies. [22-06-2013] A new demo release. A new demo has been released! Find it here: http://gamejolt.com/games/strategy-sim/ ... est/28536/. The last couple of months I've been busy rewriting the whole thing. In the previous version I didn't correctly OOP, and made a mess for myself in the long run, which made it very daunting to work with the code base as it got bigger and bigger. So yes, I've been busy with the game, but rather than adding in new features, I've rewritten the whole thing from the ground up, to make it myself a little easier. But that's not the exciting news. What's cool is that my girlfriend offered to do all the graphics for me, because I used graphics before from opengameart, I am now working with 32 * 32 graphics specifically made for this game, which gives me almost unlimited possibilities regarding features, since I am not any longer limited by the graphics I can find. I would like to share some screenshots of how it looks right now. 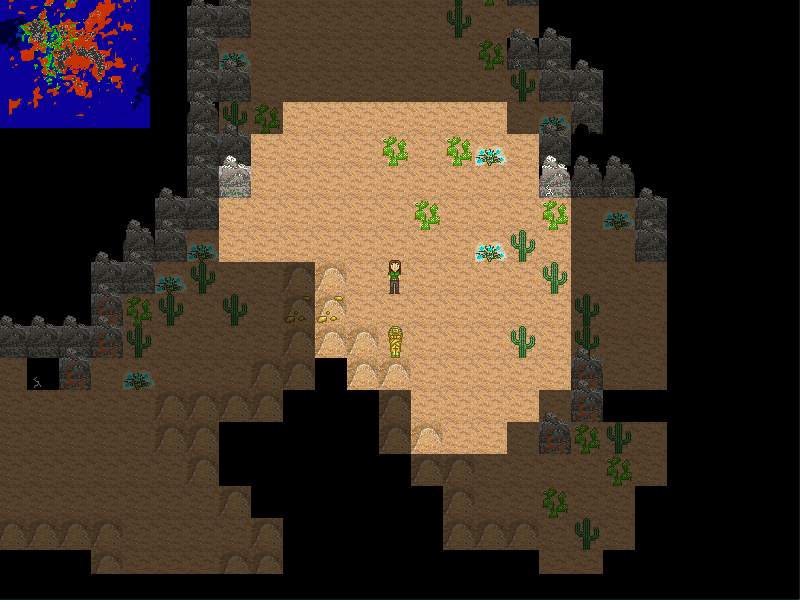 And as soon as the game gets on the same level as Alpha 0.2 was, I will share the latest version with you guys! - Health system overhaul (no more health, but rather wounds, for instance a cut in your arm that needs treatment before it infects, and with deeper wounds it could lead to a lethal amount of blood loss). - Leveling (strength, dexterity, etc.) (Unbalanced, very easy to become very strong). - Dungeon crawling: 75% done (inactive until 100% completion). - Randomized loot for dungeons: 0% done. - Pet system: 0% done. - More variation in crafting/cooking/brewing recipies. 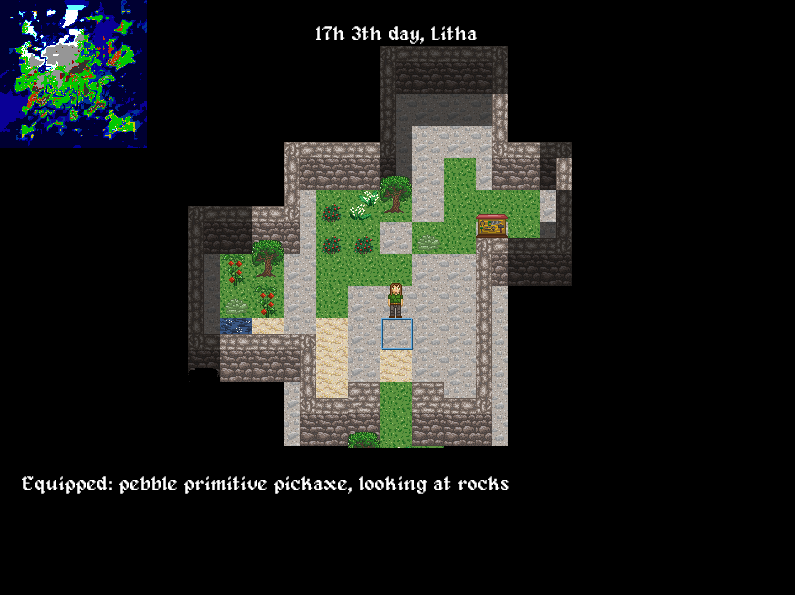 - More variation in naturally occuring tiles (more kinds of stone/ore/wood, etc). Please enjoy and tell me what you think. Last edited by VividReality on Mon Jun 23, 2014 2:13 pm, edited 7 times in total. Last edited by bekey on Fri Jan 24, 2014 2:03 am, edited 1 time in total. I have no idea why that is, but I'll try the game on another computer and see if it runs there. For me it runs fine on two computers I've tried. Also, what OS are you using? I've haven't played minecraft or Dwarf Fortress, so probably somebody closer to the survival/world creating genre would be a better reviewer. I don't really enjoy the game as it is, but I'm impressed by the features implemented so far. And the screenshots you took look pretty (the campfire pic especially). Eventually, it would be good to generate some sort of music, too. Even if most people end up turning it off, it's useful for initially engaging the player. If there's already a way to zoom in/out, make sure it's stated on the help overlay. Overall though, good work. I'm impressed by the technical feats shown here. Keep it up! Thank you for your feedback, CaptainMaelstrom. I can see that this game is not for everyone. 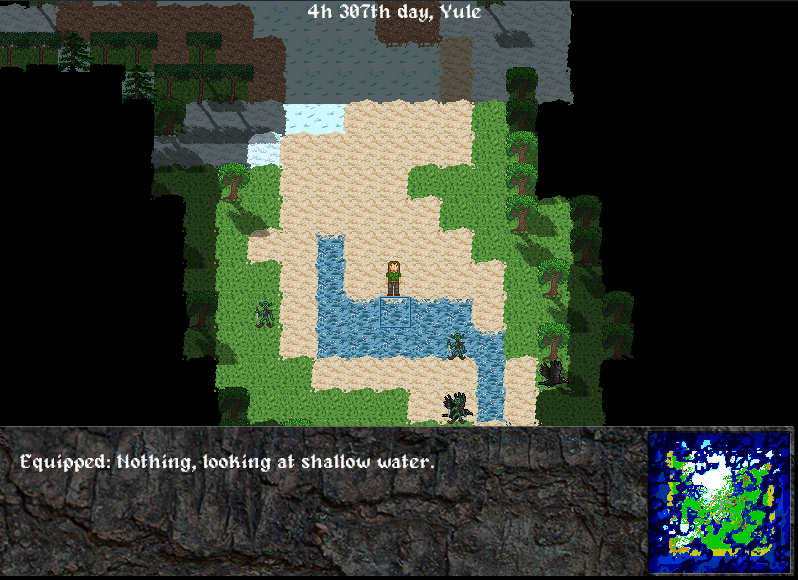 And not at all a game unless I add quests, storyline, and actual dungeon crawling. But yeah, the basic features are there and it seems playable/enjoyable at least to me . I hope it will be as fun for some other players as well! I am glad that the game works now, bekey. Thanks for testing! Have you thought about some kind of tutorial? I tried it and was confused at first because I couldn't punch down trees with my bare hands. It took me a while to find out that I needed to get rocks. Great game hope you continue to work on it. Is there a way to swim? Otherwise these situations will be very common. Also, how do I know where I am on the minimap (without showing the big map)? I would also love to be able to turn without moving. Otherwise it's impossible to beat an enemy that is chasing you. This is looking good, please do continue. headchant, I am working on a tutorial system right now. It works kind of like achievements, with a discriptive way to explain what your next step could be when you're stuck. I will continue working on this system, so that I can use it as a questlog as well, because very soon I'll start working on quests. Thank you for trying and liking the game! kikito, you can press "r" until you find a location where you want to stay and play the game. The map... good idea. I'll add a better way to view where you are. If I am not mistaken there should be a little dot where you are on the minimap, but I agree it's almost not visible. I'll work on that. About the turning, I'll add that to the to-do list as well! For now, you can press "l" to look and do several tasks within a range. For instance, you can use "l" to select a tile and shoot a bow very far. but melee has a shorter range, so you can only hit 2 blocks away. That's probably the best way to do it right now. Thanks for trying the game! Also, there is an update. I've been working on texturepacks! I'll update the main post! "Cannot create canvas. Not supported by your OpenGL implementation." All your code are belong to us.